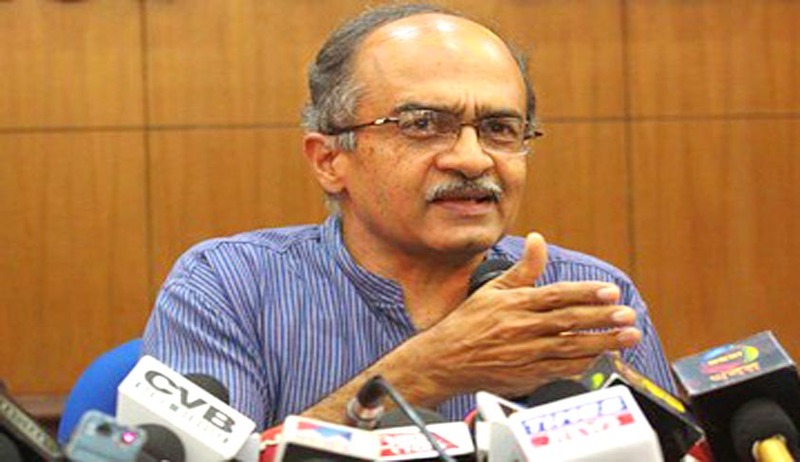 A Delhi High Court bench of Justice Rajiv Shakdher has issued a notice to the Central Government demanding the grounds on which a passport issued to Supreme Court lawyer and activist Mr. Prashant Bhushan was only renewed for a period of 1 year and not with full 10 year validity. The Bench asked the Government, "If someone holds a valid passport but against him some minor traffic violation case is filed, then can you stop subsequent reissue of his passport?" "Only if a court impounds the passport or puts restrictions on the foreign travel of a person can the passport validity can be restricted," the court noted. Mr. Bhushan had filed a Writ Petition in the Delhi High Court Challenging the Constitutional validity of the Notification No. GSR 570(E) dated 25-08-1993 issued by the Government and thereby urging the Government to renew his passport with full 10 year validity. Being a founding member of India against Corruption, Mr. Bhushan had staged a protest in Delhi against the coal scam in August, 2012. A few cases were thereby registered against him for violating Section 144 of the Cr.P.C. for participating in an assembly which was declared unlawful. These cases are pending in Patiala House courts. Mr. Bhushan had applied for issuance of a fresh passport. However, the Government cancelled his old passport in June 2014. He was informed that in order to get his passport reissued, he needs to first obtain a NOC from the concerned court where criminal cases are pending against him. An NOC was granted by the Metropolitan Magistrate in September 2014. Despite the NOC, his passport was only renewed for a period of 1 year instead of 10 years. This was pursuant to a 1993 notification and it was reasoned that for re-issue of passport for full validity cannot be acceded to unless the Court issues a fresh order in this regard. This notification states that in case criminal proceedings are pending against a citizen, and an order is issued by the concerned Court permitting them to depart from India, the passport will be issued for a period of one year in case no period of issue or travel abroad is specified in such order. The Petition hence states that, “This restriction is totally arbitrary since if the court has not found it fit to impound the passport of an accused or has not laid any restriction on his foreign travel, then merely because someone’s passport is coming up for renewal or reissue, he cannot be forced to first seek an NOC from the court only because some case is pending against him. A person who holds a valid passport would not face this restriction, but only a person who does not hold a passport or whose passport needs renewal will. Therefore the said restriction is arbitrary, unreasonable and also discriminatory, and thus in violation of Article 14 of the Constitution. The notification is further challenged on the ground that it makes no distinction between persons facing charges of committing heinous offences and those charged with mere presence in an assembly which the police deems to be unlawful. Relying on his right to travel abroad, Mr. Bhushan has relied on the landmark decisions in case of Satwant Singh Sawhney v. D. Ramarathnam, Assistant Passport Officer (1967) 3 SCR 525 and Maneka Gandhi v UOI, (1978) 2 SCR 621. The case will now be heard on 16th March, 2015.